Is it time to service your Toyota in Houston? Visit the professionals at Fred Haas Toyota Country! Our service department can take care of your next oil change, tire rotation, brake needs and more. Our service department also services all makes and models. Make us your service destination in Houston, Texas. Top Toyota Service Department in Houston, Texas! 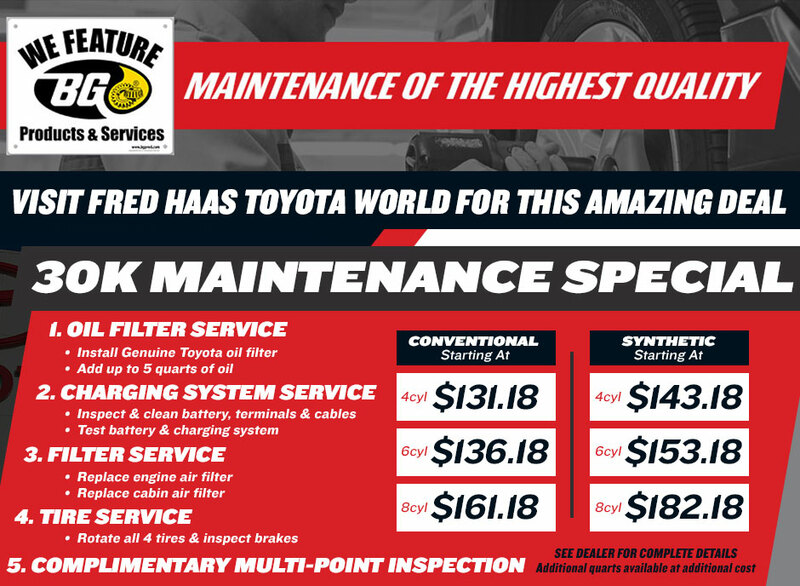 Stop by and see our service department in Houston at Fred Haas Toyota Country for any auto service needs! We can accommodate any service with our flexible hours, factory-trained technicians and top of the line parts & equipment. We offer a VIP waiting area with children's play room, FREE WiFi, FREE fountain drinks, FREE Shuttle & so much more! Take a moment to familiarize yourself with the service schedules as per our Toyota-certified and factory-trained auto repair technicians' recommendations. Click below to schedule an appointment.